A cow is a ruminant, and RUMINANTS are MEANT to PRIMARILY consume LONG-stemmed fibers in the form of grass and hay. Click photo to see a short video on cud chewing in action. Notice toward the end, she stops, swallows, and starts again. The grass first enters the RUMEN in almost its original state, stems of grass. Juices in the rumen mix with the grass and other feeds, churn, and start to break down (ferment) in a process called “rumination”. Next, the cow regurgitates a portion of the partially fermented feeds and chews the mass between the teeth in the back of her jaw (upper and lower teeth). This process is called cudding and the chewed fibrous feeds are called “cud”. Seeing a cow “cud” is the foremost indicator of cow health! Once the cow completely chews her cud, she re-swallows the material back down into her rumen and it passes along into the RETICULUM. The Reticulum is also called “many plies” because it is a mass of little folds.The Reticulum is where nutrients start to be absorbed into the bloodstream of the cow. The primary benefit of the reticulum is the protection provided by the folds. This second stomach is where a magnet will lodge, if a cow a is given a magnet. The many folds of the reticulum capture and hold foreign objects such as nails or wire. A magnet helps the cow by grabbing hold of the metal pieces, so that those pieces do not puncture the wall of the stomach. The partially absorbed material next flows into the OMASUM, where the majority of absorption of nutrients takes place. 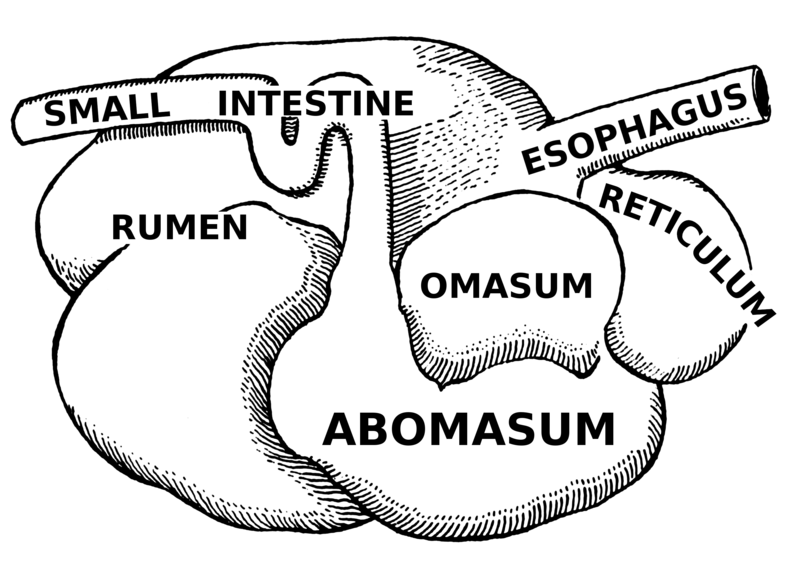 The ABOMASUM (called “true stomach”, similar to a human stomach) is the final step in the four chamber stomach of a cow, completing the breakdown process of feedstuffs before entering the intestines. I read this interesting article on a balanced ration for ruminants and why grain needs to be fed in a limited manner (or not at all). Low pH means bacteria like e-coli can exponentially grow, allowing for disease to harm a cow much easier than if she was eating her natural diet of grasses (with minimal grain as supplement). Grain is a supplement. 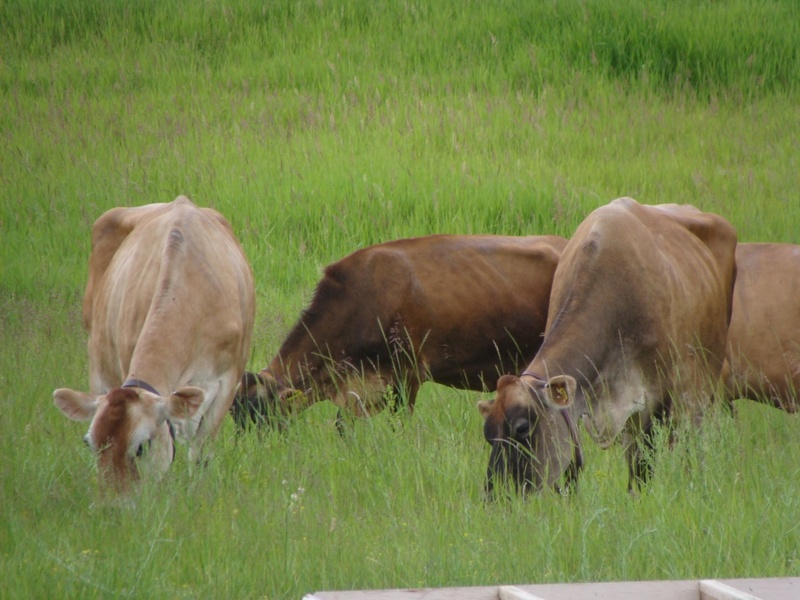 Well-kept pastures should be sufficient in protein and energy quality even for a milking cow. [Read more here: Rotational Pasturing ] While we find many benefits in fall calving, a grass-fed operation should seriously consider spring calving for their milk cow(s). In winter, hay (even of high quality) may not be sufficient for a milking cow, therefore grain may need to be supplemented to fresh and mid-lactation dairy cows. Feeding minimal amounts are preferable & working on a breeding-up program of offspring cows “that take care of themselves” can help minimize grain needs. With the known ill-effects of feeding high levels of grain COMBINED with the expense of purchasing grain – there is no reason for a cow to consume high levels of grain. The complex factory of the rumen as defined above illustrates further why a cow requires a grass-based diet rather than a grain-based diet. Calves, if fed real milk and tender hay, should never have need of grain (whether for meat or dairy) unless your intention is to push abnormal growth or if you do not have enough supply of fresh milk to raise a calf. you use to avoid use of grain for your dairy herd!